January 10, 11, 12, 13 & 14, 1967. FOR their next major production of the season, the Wick Theatre Company will present Night Must Fall, a thriller by Emlyn Williams, at the Barn Theatre, Southwick Community Centre, from January 10 to 14. Following the success of Gigi on five nights in November, the company has decided to run five performances again. The cast is already in rehearsal under the direction of the company’s secretary, Ian Elliott, who directed both the revues in recent years. Two newcomers to the company, and to the Barn stage, will be Doris Rumpus, as the waspish housekeeper, Mrs Terence, and Margaret Ockenden as the sympathetic ladies companion, Olivia Grayne. These two characters live with the widowed Mrs Bramson, who employs them, in a lonely country cottage. Their household is disturbed by the arrival of the mysterious Dan, a bellboy at a neighbouring hotel. The discovery of the body of one of the guests at the hotel throws suspicion on to Dan. Another murder leads to a thrilling conclusion. Dan will be played by David Goodger, Mrs Bramson by Angela Bolton, Olivia Grayne by Margaret Ockenden, Huber Laurie by Ralph Dawes, Nurse Libby by Dorothy Burnside, Mrs Terence by Doris Rumpus, Dora by Janice Hopper, Inspector Belsize by Ian Elliott, and the Lord Chief Justice by Robert del Quiaro. Two murders and a near miss are giving the audiences the ‘creeps’ at the Barn Hall, Southwick, this week, where the Wick Theatre Company is staging Emlyn William’s Night Must Fall. The play is pregnant with atmosphere and foreboding, with a psychopath on the prowl in and around a lonely bungalow in Essex. As audiences will find for themselves at the fourth performance tonight [Friday] and the final one tomorrow night, the cast really get their teeth into some strong meat. Producer Ian Elliott, who also appears as the police Inspector, has succeeded in building up an increasing pressure of suspense, with the quality of the acting visibly improving as the grisly tale unfolds. Angela Bolton as Mrs. Bramson, owner of the bungalow, well sustains the rôle of this testy hypochondriac who confines herself to a wheelchair, and who falls victim to the blandishments of Dan, the country club page boy who plays an increasing part of he life. David Goodger impresses as this key character and contributes some really dramatic moments when his evil past catches up with him. There is a nicely-sustained study by newcomer Margaret Ockenden as repressed Olivia Grayne, Mrs. Bramson’s niece, and Ralph Dawes commendably plays her rejected suitor, Hubert Laurie. Janice Hopper makes the best of Dora Parkoe, the downtrodden maid – the period is the class-conscious thirties – and light diversion is provided by Doris Rumpus, a new face, as sharp-tongued Mrs. Terence and by Dorothy Burnside as the district-nurse. The taped voice of Bob del Quiaro is heard as Lord Chief Justice in the prologue. The setting and costumes are admirably in period. Assisting backstage are Ian Leavey, Sally Bishop, Frank Hurrell, Terry Mase, Margaret Perrett, Morfydd Bowen, John Perrett, Elizabeth Penney and Vincent Joyce. I feel that the primary task of a producer is to present the author’s play as the producer sees it. 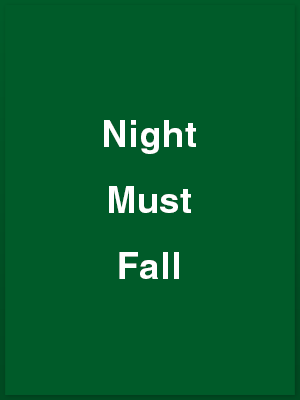 Thus one cannot quarrel with Ian Elliott’s direction of Night Must Fall for the Wick Theatre Company. That Danny has been changed from the whimsical Welsh boy to a much more robust character is fine, if the producer could see him in no other way, but not if he were merely casting around for a different way of presenting the play. Thus David Goodger did a very good job of Dan, in the style in which the play was directed, but for me much of the tension was lost. The other characters with whom Dan becomes involved were inhibited in their reaction to him because he had been turned into a personally unattractive young man. At times, too, he made very long pauses. The ‘pause for effect’ is a well-known and valuable device but these pauses were so long that we had time to think, and thus they became demonstrable theatrical tricks. The story of Danny’s infiltration into the household of the hypochondriac Mrs. Bramson, his relationship with her niece Olivia, and his arrest for murder is well known, and it has always seemed to me that Olivia is one of the most difficult parts written in modern times. the playing of it depends entirely on Danny, and Margaret Ockenden did not have, in this new-style Danny, a suitable character for whom the love-hate relationship could be developed. Angela Bolton was excellent as the petulant Mrs. Bramson and all the lesser parts in the play were particularly well done. Doris Rumpus as the housekeeper found all the humour in the part without, as I have seen done, making her a farcical character. Janice Hopper was prettily pert as the housemaid, Dora Parkoe, but, a parlourmaid’s uniform and brown shoes?… Really! Ralph Dawes played the boring Hubert Laurie so well that, as someone said, he might have made a deep study of crashing bores. The part of the police inspector was played by the producer and the voice of the Lord Chief Justice was that of Robert del Quiaro.